Imagine you throw a ball as hard as you can. The ball flies through the air and lands some distance away. The harder you’re able to throw the ball, the further away it will land. When you throw the ball, it follows a ballistic trajectory, from where it takes off, to where it lands; its path is defined by the speed of its launch and the force of gravity pulling it down (and a little bit of atmospheric drag). Now take this analogy further. Imagine you could throw the ball so hard that it flew all the way around the Earth and hit you on the back of the head. If you could throw the ball a little harder, it would go into orbit, continuously falling back to Earth, but with enough velocity to continue going around the planet. This speed is about 28,000 km/hour – it’s pretty hard to throw a ball that hard. The first spacecraft were launched in a ballistic, or sub-orbital trajectory. They reached space, 100 km above the surface of the Earth, but they didn’t have enough energy to go into a true orbital trajectory. For example, the recently built SpaceShipOne doesn’t have any horizontal velocity. It travels straight up at a speed of about 1 km/s. Compare this to a low-Earth orbit escape velocity of 7.7 km/s. If a spacecraft is going to cover some horizontal distance, it needs have a maximum speed somewhere in between. 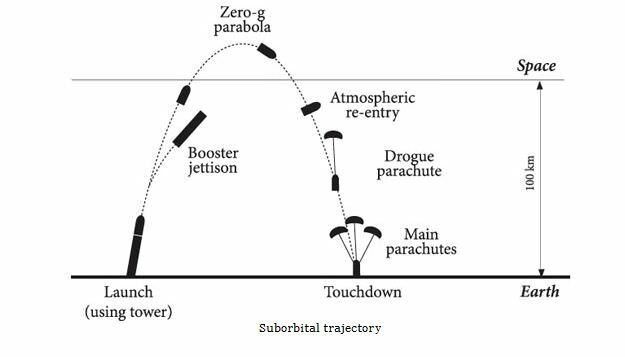 Spacecraft with a higher speed will travel along a ballistic trajectory. For example, the V2 rockets launched by Germany during World War II reached space and traveled about 330 km. Their maximum speed was 1.6 km/s. In intercontinental ballistic missile travels much faster, reaching a speed of 7 km/s and an altitude of 1200 km. Future intercontinental passenger flights might follow a similar trajectory. We have written many articles about trajectory for Universe Today. Here’s an article about the Bolide, and here’s an article about the lunar orbit. If you’d like more info on Trajectory, check out an article about Trajectories and Orbit, and here’s a link to Reduced Gravity Trajectory Page.